Artist Ken Lindstrom wanted to create a temporary public art piece—sixteen plastic spirals to honor sixteen years of Art Walk, an annual event showcasing the visual and performing arts in Salida, Colorado. But when Lindstrom contacted the city planning office, he learned he couldn’t erect art on city property without a public art committee review, a process that might take a year or two. He titled his work “What Goes Around, Comes Around,” a fitting theme for public art in rural and suburban Colorado, which struggles for support, understanding, and funding, yet somehow manages to find a way to exist and enrich the lives of those living in rural communities around the state. According to Jil Rosentrater, director since 2006 of the state’s Art in Public Places Program (AIPP), there are over 40 organized public art programs around Colorado, half located in the urban corridor of the Front Range and the suburbs of Denver, the other half dispersed around the state. The Colorado General Assembly adopted its public art program in 1977, allocating 1 percent of new or renovated state-funded capital construction to public art. In 31 years, more than 400 works have been commissioned or placed in state buildings for the enjoyment of Colorado citizens. 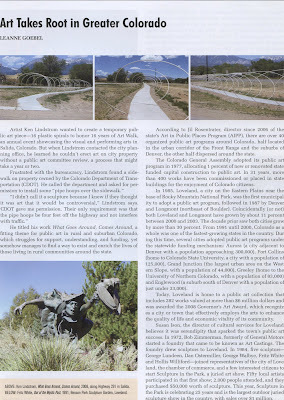 In 1985, Loveland, a city on the Eastern Plains near the base of Rocky Mountain National Park, was the first municipality to adopt a public art program, followed in 1987 by Denver and Longmont (Northeast of Boulder). Coincidentally (or not) both Loveland and Longmont have grown by about 11 percent between 2000 and 2003. The decade prior saw both cities grow by more than 30 percent. From 1991 until 2000, Colorado as a whole was one of the fastest-growing states in the country. During this time, several cities adopted public art programs under the state-wide funding mechanism: Aurora (a city adjacent to Denver with a population approaching 300,000), Fort Collins (home to Colorado State University, a city with a population of 125,000), Grand Junction (the largest urban area on the Western Slope with a population of 44,000), Greeley (home to the University of Northern Colorado, with a population of 83,000) and Englewood (a suburb south of Denver with a population of just under 33,000). 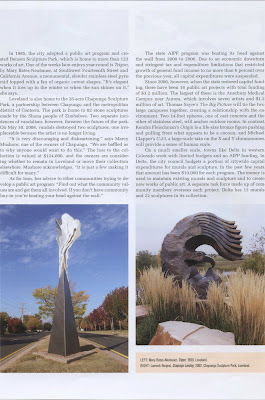 Today, Loveland is home to a public art collection that includes 282 works valued at more than $6 million dollars and was awarded the 2008 Governor’s Art Award, which recognizes a city or town that effectively employs the arts to enhance the quality of life and economic vitality of their community. Susan Ison, the director of cultural services for Loveland, believes it was serendipity that sparked their public art success story. In 1972, Bob Zimmerman, a former General Motors foundry worker, started a foundry that came to be known as Art Castings. The foundry drew sculptors to Loveland. 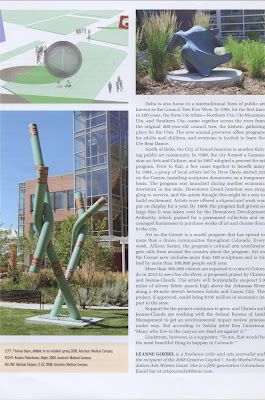 In 1984, five sculptors, George Lundeen, Dan Ostermiller, George Walbye, Fritz White, and Hollis Williford, joined with representatives of the city of Loveland, the chamber of commerce and a few interested citizens to start Sculpture in the Park, a juried art show. Fifty local artists participated in that first show; 2,000 people attended and they purchased $50,000 worth of sculpture. This year, Sculpture in the Park is celebrating 25 years and is the largest outdoor juried sculpture show in the country, with sales over $1 million. In 1985, the city adopted an public art program and created Benson Sculpture Park, which is home to more than 123 works of art. One of the works Ison enjoys year round is Trigon by Mary Bates-Neubauer at Southwest Fourteenth Street and California Avenue, a monumental, slender stainless steel pyramid topped with a fan of organic cutout shapes. “It’s elegant when it ices up in the winter or when the sun shines on it,” she says. Loveland is also home to the 26-acre Chapungu Sculpture Park, a partnership between Chapungu and the metropolitan district of Centerra. The park is home to 82 stone sculptures made by the Shona people of Zimbabwe. Two separate incidences of vandalism, however, threaten the future of the park. On May 30, 2008, vandals destroyed two sculptures, one irreplaceable because the artist is no longer living. “It is very discouraging and disheartening,” says Marcy Mushore, one of the owners of Chapungu. “We are baffled as to why anyone would want to do this.” The loss to the collection is valued at $124,000, and the owners are considering whether to remain in Loveland or move their collection elsewhere. The state AIPP program was beating its head against the wall from 2000 to 2006. Due to an economic downturn and stringent tax and expenditure limitations that restricted growth of general fund income to no more than 6 percent over the previous year, all capital expenditures were suspended. el, will anchor outdoor rooms. In contrast, Kendra Fleischman’s Origin is a life-sized bronze figure pushing and pulling from what appears to be a cocoon, and Michael Clappers C-23, a large-scale take on the X and Y chromosome, will provide a sense of human scale. On a much smaller scale, towns like Delta in western Colorado work with limited budgets and no AIPP funding. In Delta, the city council budgets a portion of citywide capital expenditures for murals and sculpture. In the past few years, that amount has been $10,000 for each program. The money is used to maintain existing murals and sculpture and to create new works of public art. A separate task force made up of community members oversees each project. Delta has 13 murals and 22 sculptures in their collection. Delta is also home to a nontraditional form of public art known as the Council Tree Pow Wow. In 1995, for the first time in 100 years, the three Ute Tribes—Northern Ute, Ute Mountain Ute, and Southern Ute—came together across the river from the original 200-year-old council tree, the historic gathering place for the Utes. The pow wow offers programs for adults and children and everyone is invited to learn and dance the Ute Bear Dance. North of Delta, the City of Grand Junction is another thriving public art community. In 1990, the city formed a Commission on Arts and Culture, and in 1997 adopted a percent for art program. Prior to that, a few came together to benefit many. In 1984, a group of local artists led by Dave Davis started Art on the Corner, installing sculpture downtown on a temporary basis. The program launched during another economic downturn in the state. Downtown Grand Junction was struggling to survive, and the artists thought it might be a way to build excitement. Artists were offered a stipend and work was put on display for a year. By 1989, the program had grown so large that it was taken over by the Downtown Development Authority, which pushed for a permanent collection and encouraged businesses to purchase works of art and donate them to the city. Art on the Corner is a model program that has spread to more than a dozen communities throughout Colorado. Every week, Allison Sarmo, the programs cultural arts coordinator, gets calls from around the country about the program. Art on the Corner now includes more than 100 sculptures and is visited by more than 300,000 each year. More than 380,000 visitors are expected to come to Colorado in 2012 to see Over the River, a proposed project by Christo and Jeanne-Claude. The artists will horizontally suspend 5.9 miles of silvery fabric panels high above the Arkansas River along a 40-mile stretch between Salida and Canon City. A project, which if approved, could bring $195 million dollars in economic impact to the state.